A T-S diagram is a graph showing the relationship between temperature and salinity as observed together at, for example, specified depths in a water column. Isopleths of constant density are often also drawn on the same diagram as a useful additional interpretation aid. In the ocean certain T-S combinations are preferred which leads to the procedure of identification via the definition of water types and water masses and their distributions. These example scripts create T-S diagrams based on global or CESM/POP-defined ocean basins employing a scattergram format with temperature on the ordinate (Y axis) and salinity on the abscissa (X axis). Christine Shields, an associate scientist at NCAR, provided these example scripts. 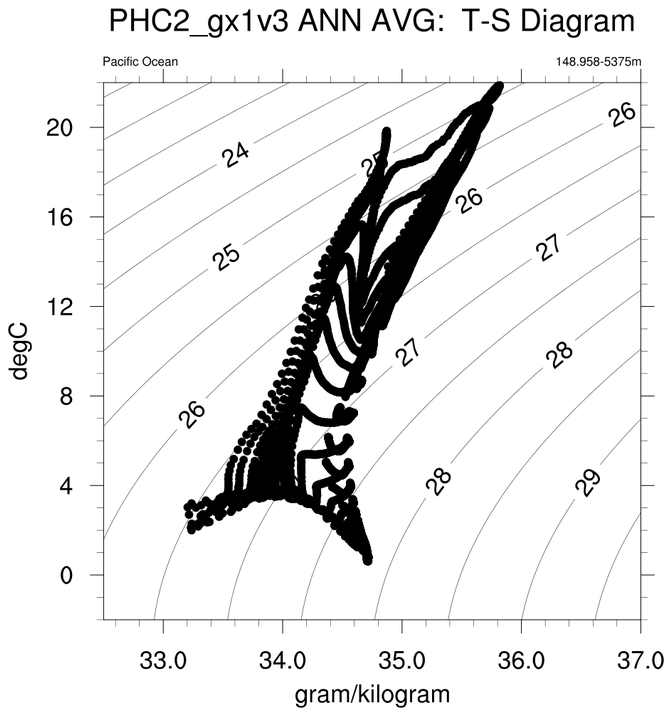 tsdiagram_1.ncl: This script plots temperature versus salinity as an XY plot across a user-specified depth range for a user-specificed CESM/POP-defined ocean basin. Potential density is overlaid as contours (calculated using rho_mwjf) as contours. tsdiagram_2.ncl: This is similar to the previous example, except several T-S diagrams are created using different basins, and paneled using gsn_panel.